Children play in the backyard of Casa Rachele. The children of immigrant workers and asylum seekers live in the Holy City without any protection; they speak Hebrew and feel part of Israel. The experience of welcoming all people is ever-present in Casa Rachele (Rachel’s Home). From the Jaffa Gate the slope is fast: on the right the trendy neighborhoods of modern Jewish Jerusalem; a little further there is the road that leads to Bethlehem. However, on Pinsker Street there is a gate that opens onto a world of its own: a bevy of lively children with Asian and African traits grappling with their slide, while slightly older ones are trying (with difficulty) to do their homework. Welcome to Casa Rachele, the home of those who, on paper, should not be there and instead are one of the most important challenges facing the Church in Jerusalem today. For just over a year, in some locales made available by the Capuchin friars, the Vicariate for migrants of the Latin Patriarchate has opened this structure that takes care of the children of immigrants and asylum seekers. This is happening because Israel has also been affected by the great phenomenon of migration. The figures are far from being negligible, and a high percentage of these migrants are Catholic. For example, Filipino immigrants alone number more than 50,000 strong; but there are also Indians and Thais. Those who have come here to work as caregivers, cooks, or gardeners; since the politics of separation have removed tens of thousands of Palestinians from the Israeli labor market since the 1990s. Then, there is the continent of Africa, geographically close, with about 40,000 Eritrean, Ethiopian, and Sudanese asylum seekers. It is a world growing within the Israeli society; it is living inside Israeli homes, it is a world of people who feel like they are part of Israel. Yet it is one viewed as a temporary work force, one that should not be allowed to take root. The hardest paradox is the one regarding children: Israeli law does not allow immigrant workers to have rights to form a family. In theory, a few months after birth, any children should be returned to their country of origin. Indians tend to comply while many others do not; and so here is this group of children who are actually stateless. Fr. Rafic Nahra, a priest of Lebanese origins who grew up in France, talks about their situation. Since a few months ago, he has been in charge of the Vicariate for the Hebrew-speaking Catholics of the Latin Patriarchate. As such he is also Vicar for Migrations. The overlap is not accidental: the small Jewish-speaking community (a thousand faithful throughout Israel) is living in close proximity to these Christian migrants, who speak Hebrew, as a specific vocation. This is because these migrants feel they are Israelis, and that they are the new face of the Church of Jerusalem. It was his predecessor, the Jesuit Fr. David Neuhaus, who welcomed this challenge that somehow has forced itself upon him. 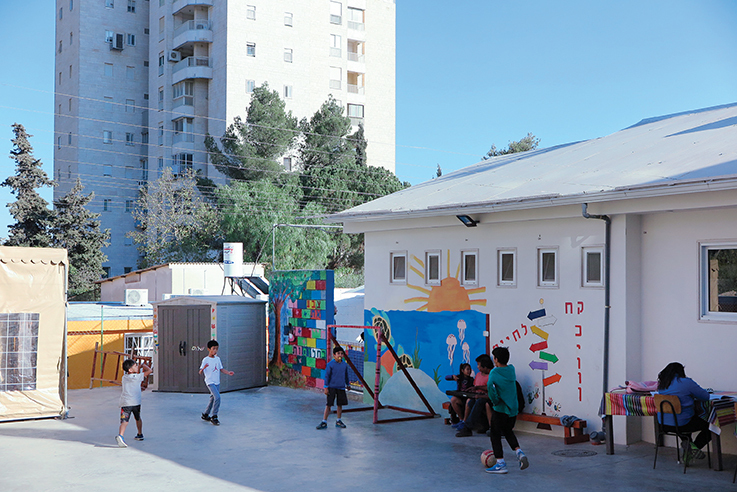 In Tel Aviv, the Pastoral Center of Our Lady Woman of Valor has been active for a few years now, and has become a point of reference for migrants in the south of the big metropolis where the greatest number of asylum seekers is concentrated. Also in Jerusalem, Casa San Simeone and Anna, the home of the Vicariate of Jewish extraction, had long been the only place where unaccompanied Filipino women, who work all day, could leave their children. However, now the room available there has proven to be woefully inadequate and so, in September of 2016, Casa Rachele was opened. “It was Fr. 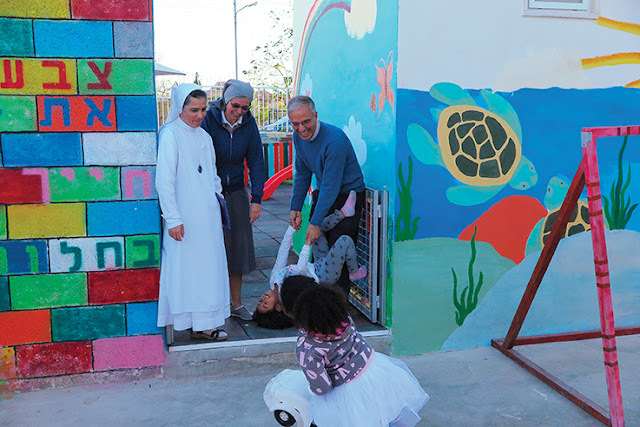 David who gave Casa Rachele its name,” explains Sister Claudia Livati, from Italy, an Ursuline Sister of San Carlo; in the Holy Land for three years now, who follows this reality full-time. Casa Rachele as “the mother who cries her children.” It is a fitting way to remember the great sufferings of these migrant women. 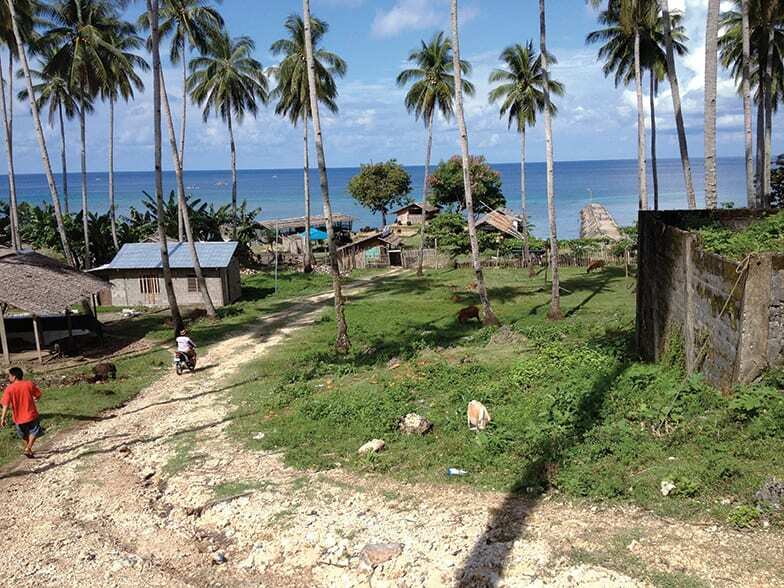 “It is suffering related to the hard life of those who have a status that remains uncertain. For African asylum seekers, for example, the situation in Israel is getting harder every day: the government does everything to discourage their stay. It cannot send them back to their countries of origin such as Eritrea or Sudan, where there are authoritarian regimes and persecutions; but it has entered into agreements with “third African countries” (officially unknown, but everyone knows that they are Uganda and Rwanda) to repatriate them anyway. Now we are talking about an ultimatum set for the end of March. Fr. Rafic and Sr. Claudia horse around with a couple of girls. Then there are others, more subtle but with no less significant challenges: “We want to give these children a true Christian identity, but at the same time without closing them in a ghetto,” Fr. Rafic explains: “It’s not easy. In the public school they acquire an identity linked to the Jewish context. Legitimately so: nobody asks the Israelis to propose a different one at school. But when we try to read the Bible with them from a Christian perspective it is difficult. We do not tell them that what they hear at school is wrong; we explain that their teachers are Jews, that this is their story, but Jesus has helped us to understand it in a new way. With time, little by little, they get it, but it’s a long process “.